Both whales and dolphins are members of the cetacean order of marine mammals. The 83 species of cetaceans, organized in 46 genera and 14 families, are divided between two sub-orders: the Mysticeti (baleen whales) and Odontoceti (toothed whales). Dolphins are toothed whales. With 32 species in 17 genera, including bottlenosed dolphins and killer whales, the dolphin (delphinidae) family is the largest of all cetacean families. Both baleen whales and dolphins live in all the world's oceans. All cetaceans have streamlined bodies without any protruding parts, allowing the animals to glide through the water. Beneath hairless skin, both dolphins and baleen whales carry a layer of blubber that keeps them warm. Dolphins have a distinctive head shape compared to baleen whales. Their protruding, bulbous foreheads hold a fatty deposit known as a "melon" that aids them in echolocation. Size further distinguishes these marine mammals. The much smaller dolphin species grow to between 5 and 32 feet long. The pygmy right whale is the smallest baleen whale at 21 feet long, while the blue whale is the largest and reaches lengths of over 100 feet. All marine mammals must surface to breathe air. Dolphins have a single blow hole they use for breathing, while baleen whales have two. As the name of their sub-order implies, dolphins have teeth, and use them to consume a wide variety of prey including fish, squid and crustaceans. Larger dolphins even eat marine birds and other cetaceans. 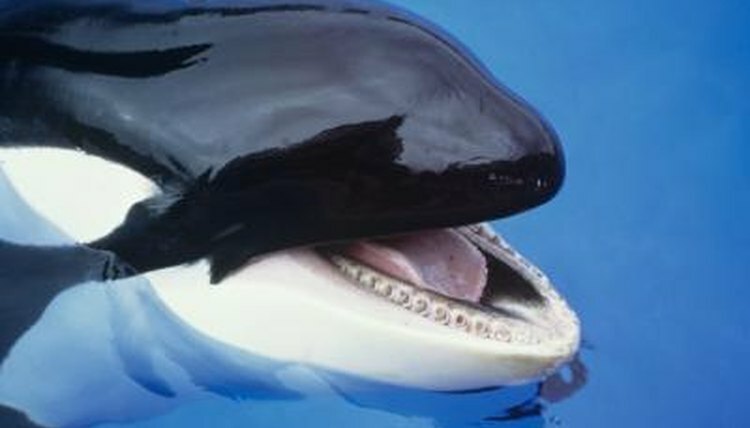 Baleen whales do not have teeth. Instead, they have rows of keratin plates. Baleen whales pull the sea into their mouths, then push the water back out through the gaps in their baleen plates, trapping small fish and plankton for food. Despite being the largest animals on land or sea, baleen whales eat plankton and krill, which are some of the smallest living species. All cetaceans spend their entire lives in oceans and rivers, where they pump their tail flukes to move through the water while using their flippers for stability. Dolphins tend to inhabit shallower waters nearer the coast, while most baleen whales live in deeper water further out to sea. Adult baleen whales usually lead solitary lives, but dolphins live in highly social groups. Dolphin pods cooperate, assisting injured pod members and protecting and defending against predators. Both baleen whales and dolphins make noises under water that serve as some form of communication. Whales use their larynxes to create low-frequency sounds as well as higher-frequency chirps and songs. Marine biologists don't know the purpose served by these sounds and songs, but believe they might communicate identification information or serve as mating calls. Baleen whales do not echolocate as dolphins and other toothed whales do. Dolphins use echolocation to navigate and make sense of their surroundings. Baleen whales and dolphins also use body language to communicate. Dolphins nudge their pod members frequently or touch each other with their flippers. Baleen whales slap their tails on the surface of the ocean and splash with their flippers when they breach, creating a sound researchers believe is a signal of some sort.